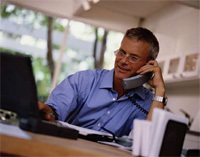 a Full VOIP system located within your office. a Hosted VOIP System that runs outside your office in a hosted facility. You have no equipment worries. The success of your business depends on making the right connections. Whether you are the owner of a small business or work remotely, you need a network that can scale to the demands of a continuously connected world. At BIRCHWOOD, we understand the power of connecting people and businesses, and we know every connection must be reliable, secure and fast. For that reason, we formed a partnership with VOIP experts to service the small and medium businesses telephony needs.